This online workout schedule maker will create a printable exercise log that you can use to organize and track your gym workouts. You can create a blank log sheet, a log sheet based on a built-in workout (my own), or a log sheet based your own categories and exercises. 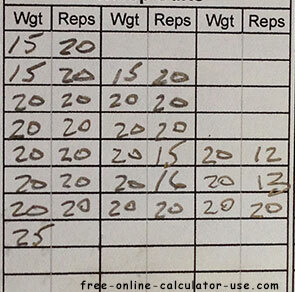 The layout of the sheet allows you to see your strength gains at a glance. The Learn tab includes my reasons for using this log sheet system as well images showing how I use the system for my own workouts. If you would like a title to be included at the top of the chart, enter the title here. If not you can leave this field blank. Select the number of sets you would like included for each exercise. Note that the higher the number of sets you select, the fewer the number of exercises that will fit within a single page. Enter a name for category #1 and then tap the "Category #1" button in this row to enter the category's exercises. Blank category name fields will not be included in the workout log sheet unless you select Blank from the Type menu. Also note that category names will be truncated to 14 characters in the printed workout sheet. Enter a name for category #2 and then tap the "Category #2" button in this row to enter the category's exercises. Blank category name fields will not be included in the workout log sheet unless you select Blank from the Type menu. Also note that category names will be truncated to 14 characters in the printed workout sheet. Enter a name for category #3 and then tap the "Category #3" button in this row to enter the category's exercises. Blank category name fields will not be included in the workout log sheet unless you select Blank from the Type menu. Also note that category names will be truncated to 14 characters in the printed workout sheet. Enter a name for category #4 and then tap the "Category #4" button in this row to enter the category's exercises. Blank category name fields will not be included in the workout log sheet unless you select Blank from the Type menu. Also note that category names will be truncated to 14 characters in the printed workout sheet. Enter a name for category #5 and then tap the "Category #5" button in this row to enter the category's exercises. Blank category name fields will not be included in the workout log sheet unless you select Blank from the Type menu. Also note that category names will be truncated to 14 characters in the printed workout sheet. Select either Filled In or Blank and then click the Preview Workout Log Sheet button. This will load the sheet into the scrollable area below the button. 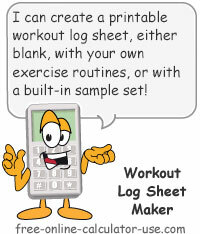 If you are happy with the preview, scroll down and click the Printable Workout Log Sheet button. This online workout schedule maker will create either a printable blank exercise log sheet, a custom log sheet based on your own categories and exercises, or a log sheet based on my own weight lifting workout schedule. Over the years of working out at the gym during the winter months (when the golf courses are closed), I've come up with a system of planning and tracking my workouts that has become very popular with my friends and family. 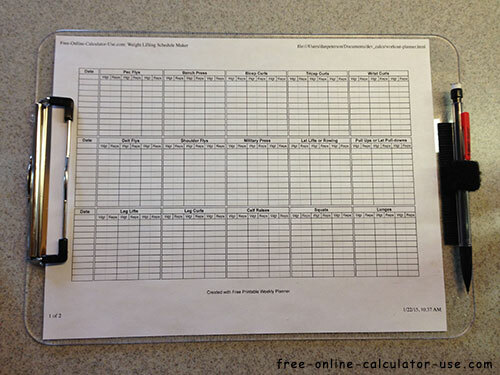 In fact, the reason I decided to add the workout log sheet maker to the website is because one of my daughters is moving out of the area and asked if there was a way I could set up something where she could design and print her own gym workout chart online. For an explanation as to how and why I use this log sheet system, please visit the Learn tab. Enter an optional title for your log sheet. Select the number of sets to include per exercise. Select the number or rows (days) to include for each exercise. If you would like to print out a blank schedule, select "Blank" as the type of chart. If you would like to print and use my weight lifting schedule, tap the "Load Examples" button and select "Filled In" as the type of chart. If you would like to create your own custom workout sheet, enter a name for each category and tap the named category buttons to enter their respective exercises. When all desired categories and exercises have been entered, select "Filled In" as the type of chart. Tap the "Preview Worksheet Sheet" button and, if you are happy with the preview, tap the "Printable Workout Sheet" button that will appear below the preview pane. This will open the completed worksheet in a printer friendly window. From there you can use your printer/page settings (portrait/landscape, scale, etc.) to fit the sheet on the paper you are printing to. How and why I use this workout log sheet system. I will attempt to explain the log sheet system I use and why it works for me, and then you can decide if you want to try the system yourself. Know where to start each new workout season. Know which exercises to do when, even if I miss a few days. Know how much weight to use and when it's time to bump up the weight. Instantly see my strength improvement over time. Workout any number of days per week while still giving muscle groups adequate recovery time. Keep my workouts short and simple, while still hitting all basic muscle groups. Here is an example of a muscle-group category (chest and laterals) made up of five exercises. Each exercise has fields to record the weight and reps for three sets, and each row in the chart represents a single day. Note that categories can be labeled as muscle groups, days of the week, or whatever you deem appropriate for your own workout plan. I start the season doing 1 set of each exercise, and then gradually increase to 3 sets. Once I get to 3 sets, I start using a weight that allows me to do sets of 20, 15, and 12 reps.
Each time I repeat the exercise, I try to increase the 2nd and 3rd sets by at least 1 rep each. Once I am doing 3 sets of 20 reps, I bump up the weight. I start each workout session with 10-minutes of stretching. Next, I do a 20-minute cardio using either an elliptical machine, stair stepper, treadmill, or jump rope (my favorite). Whichever cardio method I decide to use for a particular day, I just try to maintain my target heart rate for the full 20 minutes. Next, I complete the weight lifting exercises in the category that is due that day (1 row on the sheet), with 60-90 seconds of rest between each set. Finally, I finish the workout with three core exercises. Typically these consist of 3 30-second sets of seated oblique twists, planks, and leg raises. But I do mix it up with other core exercises, such as crunches, med ball throws, cable machine twists, and more. The total workout typically takes an hour and fifteen minutes. Since your muscles can become impervious to a given exercise after a period of time (at least in my opinion), I recommend creating and printing sheets that have the same muscle groups, but with a different method for each exercise. You then simply rotate your workout sheets on a periodic basis. For example, for biceps, one sheet might list "Dumbbell Curls", another might list "Standing Barbell Curls", and other might list "Seated Barbell Curls". Each muscle group has numerous exercise variations for targeting the group. Alternating exercise variations will not only keep your workout from getting stale, but your muscles may respond more favorably as well.